My Pool Pal's mission is to provide CONFIDENCE, FUN and PEACE OF MIND during water activities. Patti Gilmer and Pam Thomas, two dynamic sisters and owners of a children's apparel store in Gainesville Ga., Kids Stuff, had been tired of seeing their customers and friends children using blow-up arm bands, inter tubes, or oversize life jackets as a swimming/teaching aid for their children. The devices available on the market at the time were cumbersome, allowing the child no mobility or confidence, and in some cases were just down right dangerous, not to mention they all looked bad. The two sister had an idea, and through many conversations with those same customers and friends, Patti and Pam knew they were on to something, but it had to work and be fashionable at the same time. After several years of trial and error, the year is 1992 and My Pool Pal launches the first and original line of patented flotation swimwear. 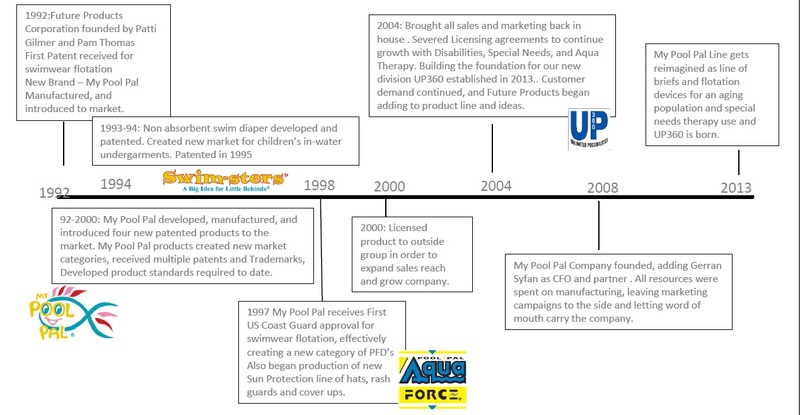 In 1993, the sisters added Swimsters® swim diaper related products to its line, in addition to other accessory items such as sun suits and sun hats. In 1994, they added the Special Needs products to its line. The Special Needs products where added as a result of parents and adults calling in requesting a suit that would fit their handicapped child or themselves. The line has been a great success with children and adults with special needs. A few years later, Patti and Pam added Aqua Force® to the line. After over a 3 1/2-year period of evaluation by Underwriters Laboratories and testing against stringent Coast Guard standards, Aqua Force® became the only product of its type to receive USCG approval in the newly created category of "Swimwear Flotation Device." Aqua Force® is classified as a Type V Special Purpose Device, meeting carriage requirements for a Type III Flotation Aid.